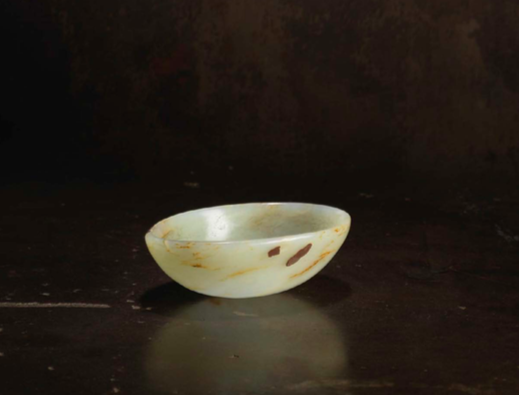 This exhibition highlights a particular form in Chinese jade culture—the vessel. 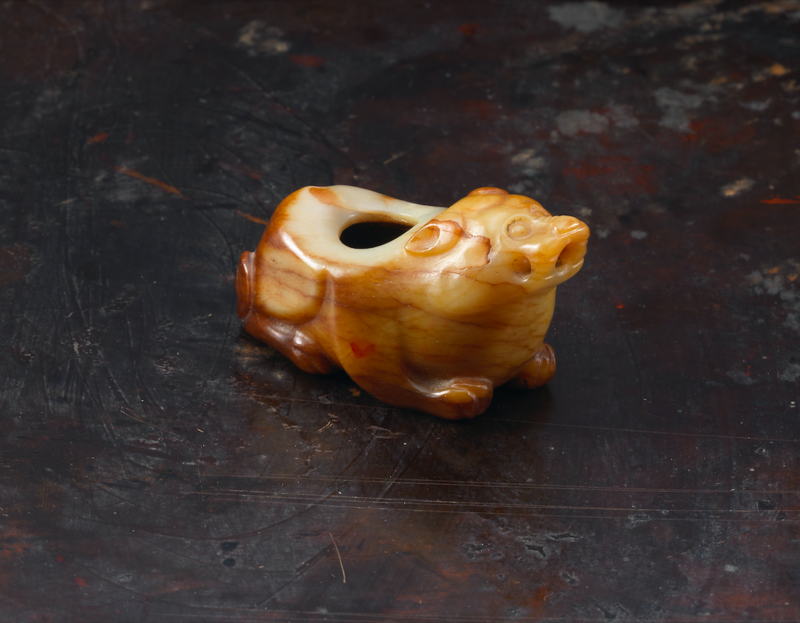 Its popularity from the Song dynasty (960–1279) to the Qianlong reign (1736–95) of the Qing dynasty (1644–1911) can be seen in the wide variety of shapes available and in the variety of stones utilized. 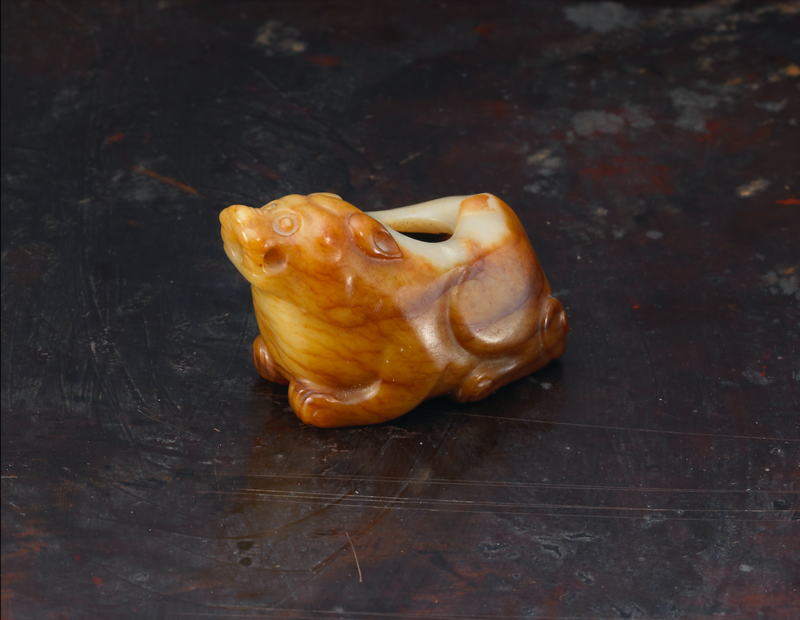 As in past jade exhibitions, the quality of carving cannot be stressed enough; it is as important, if not more so, than the colour of the jade. The Song dynasty saw an extended period of economic development and high artistic achievement. Colin MacKenzie, previously senior curator of East Asian art at The Nelson-Atkins Museum of Art in Kansas City, Missouri and now curator of Chinese art at the Art Institute of Chicago believes that in many aspects the period was more ‘modern’ than the European Renaissance, which took place between the 14th and 17th centuries (Orientations, September-October 2018, p. 93). In China, the literati way of life and its accompanying aesthetics flourished, percolating through to all forms of the arts from paintings and calligraphy to ceramics and jades. 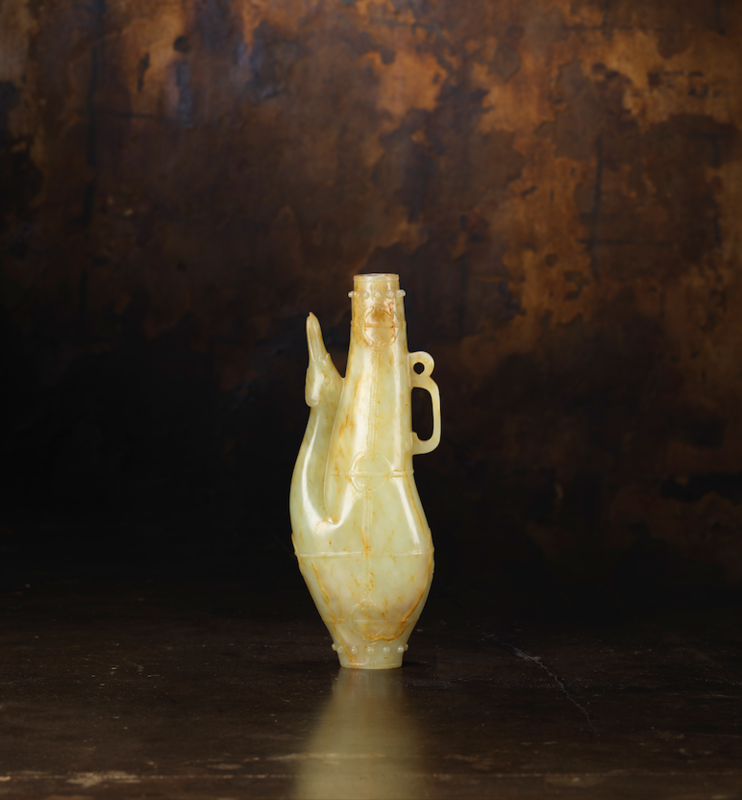 One example that epitomizes the cultured taste of this period is the ewer-form bottle with bird-head spout (no. 4) previously in the Mu-Fei Collection. In their 1990 exhibition catalogue, Bluett & Sons in London noted that the love for antiquities received great impetus from the publication of the Kaogu tu (Investigation of Antiquities with Illustrations) in about 1090 and the Gu yu tu (Illustration of Ancient Jades) in 1041. 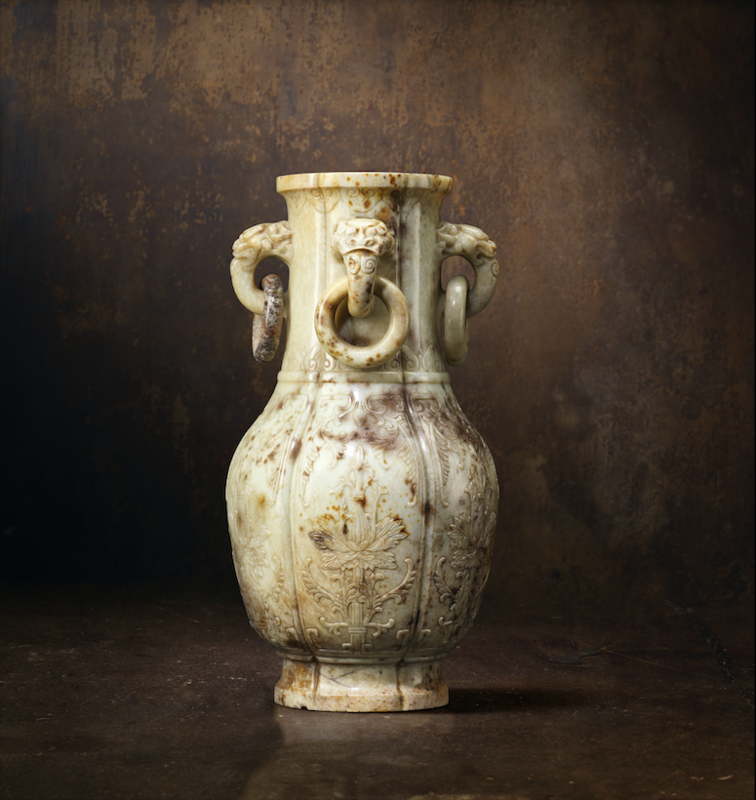 This ‘ewer’ has motifs referencing bronze vessels of earlier periods and is reminiscent of Liao dynasty (916–1125) sack-form vases. Its superbly rendered details undoubtedly make it one of the highlights of this group of vessels. 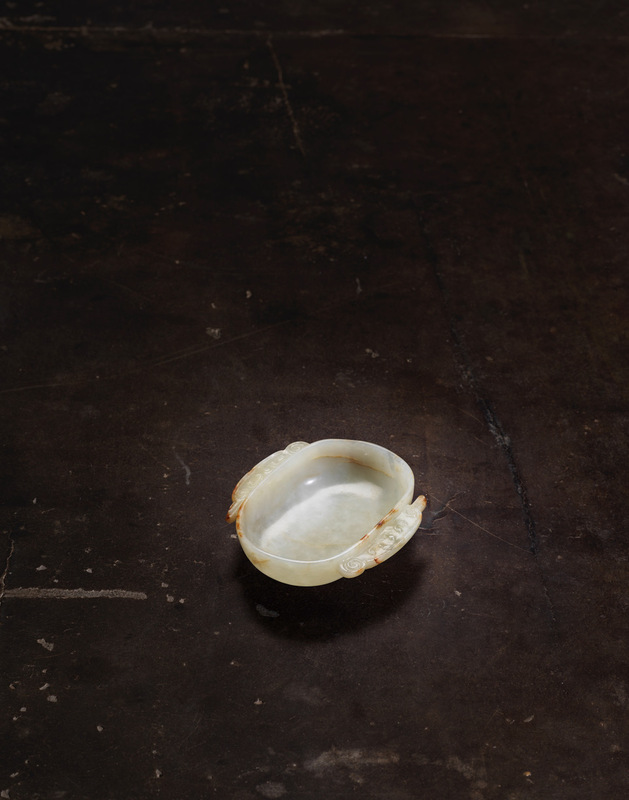 The white jade ear cup (no. 3) from the collection of Major-General Arthur K. Hay has unusual handles that are scrolled at one end and pointed at the other, imitating bronze motifs. 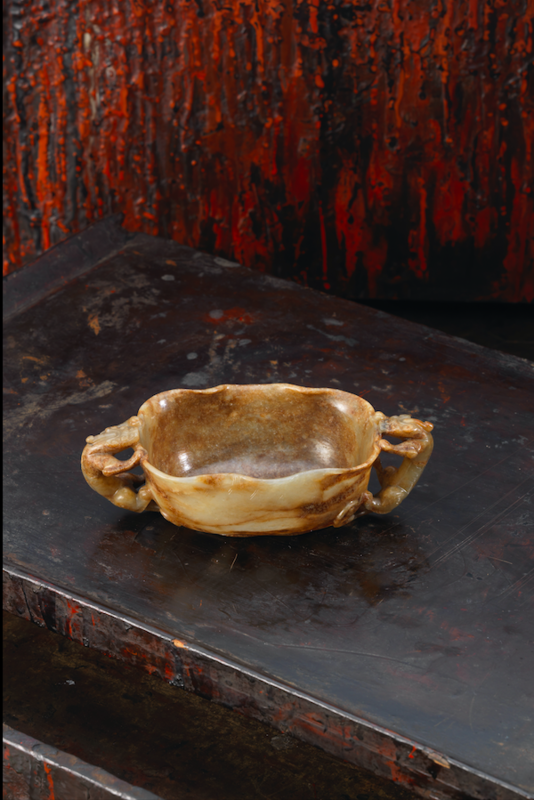 The ear cup shape itself evolved from semi-ovoid handles on vessels of the Spring and Autumn period (770–476 BCE), which were detached during the Warring States period (475–221 BCE) and Han dynasty (206 BCE–220 CE) and turned into cups. The design on this particular piece is a flight of fancy, like that on the ewer above. 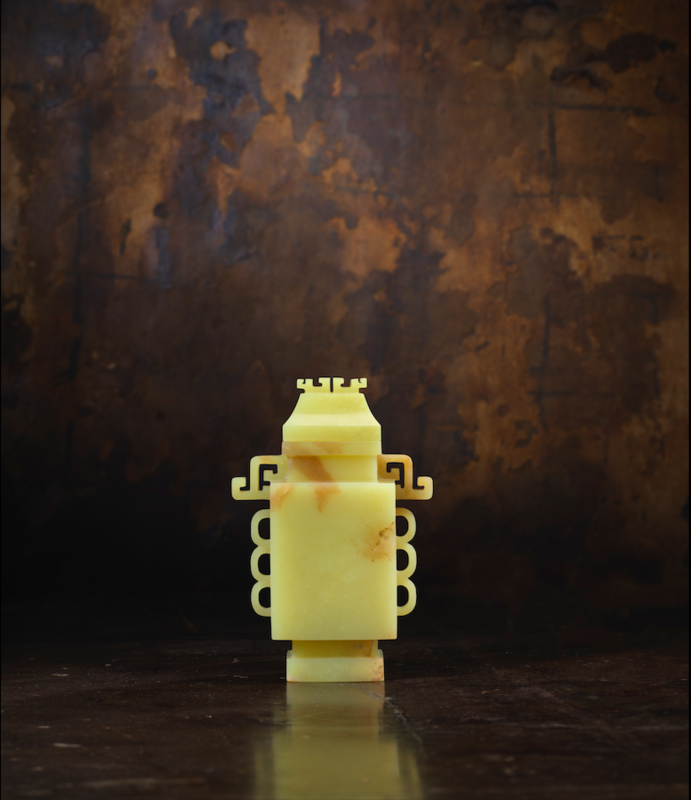 It was probably made in the Song dynasty, when craftsmen often looked to earlier periods for inspiration before taking the design to another level of refinement. 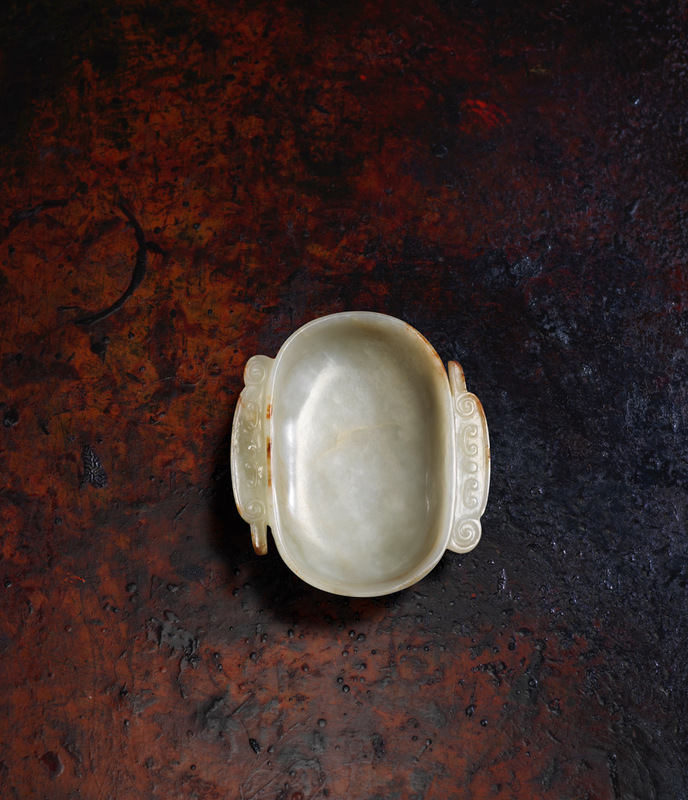 The thinness of the walls, the polish and the stone are similar to a yellow jade ear cup conservatively dated to the Song to early Ming dynasty (1368–1644), once in the Gerald Godfrey Collection and exhibited by Knapton Rasti Asian Art in 2013. 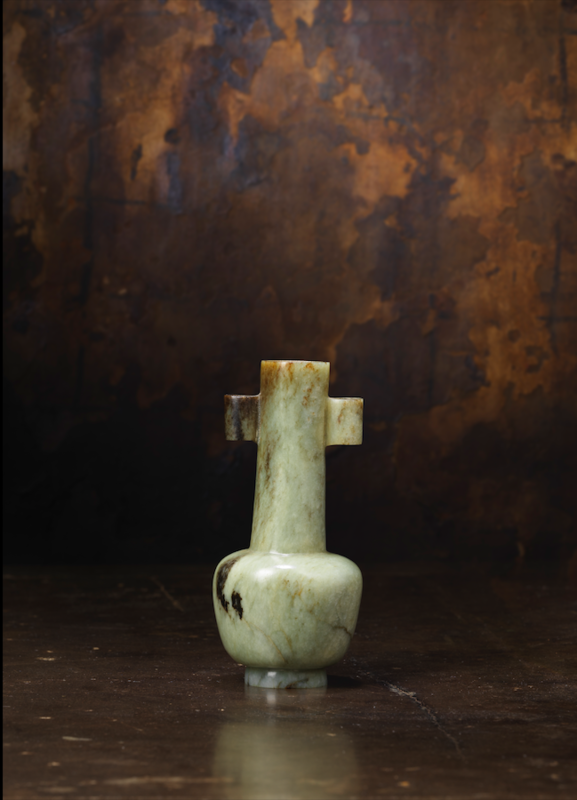 The jade arrow vase (no. 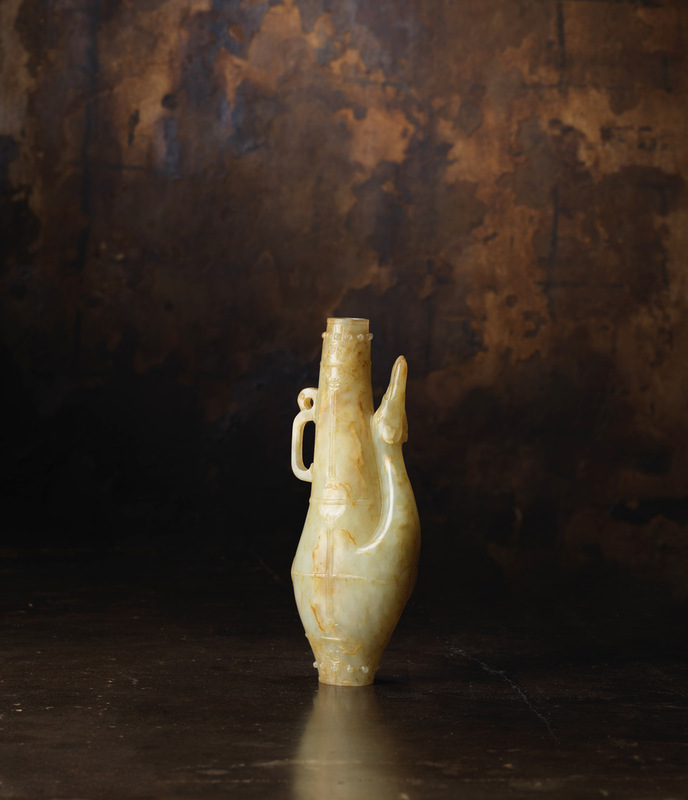 7), while representative of jade vessels, is perhaps more appealing to unusual tastes due to its grey colour. This shape is seen not only in ceramics, but also in bronzes and other materials. 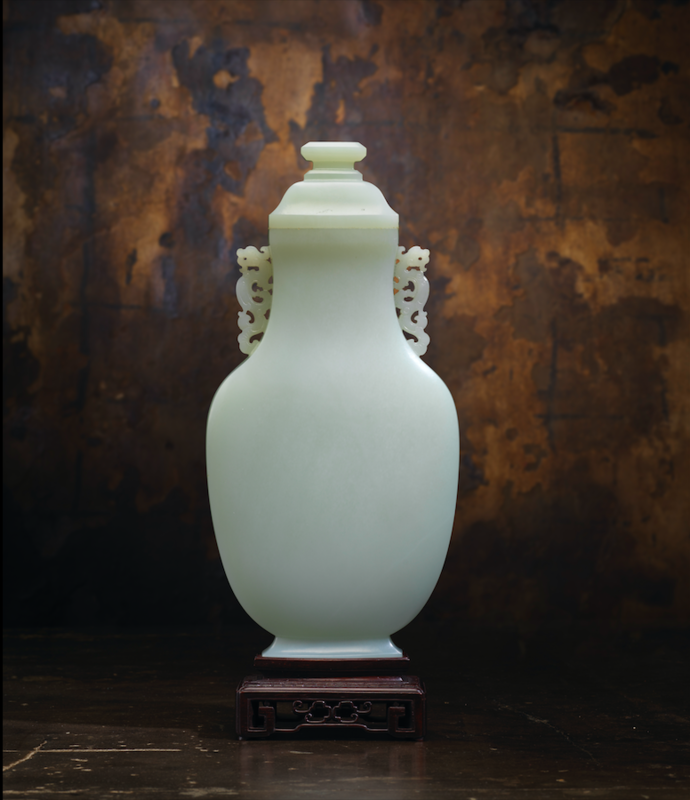 The stone’s colour and weight are typical of jades from the Yuan (1271–1368) to the early Ming dynasty. For far too long, similar objects have been overlooked because of the colour of the stone when they should be prized for their rarity. 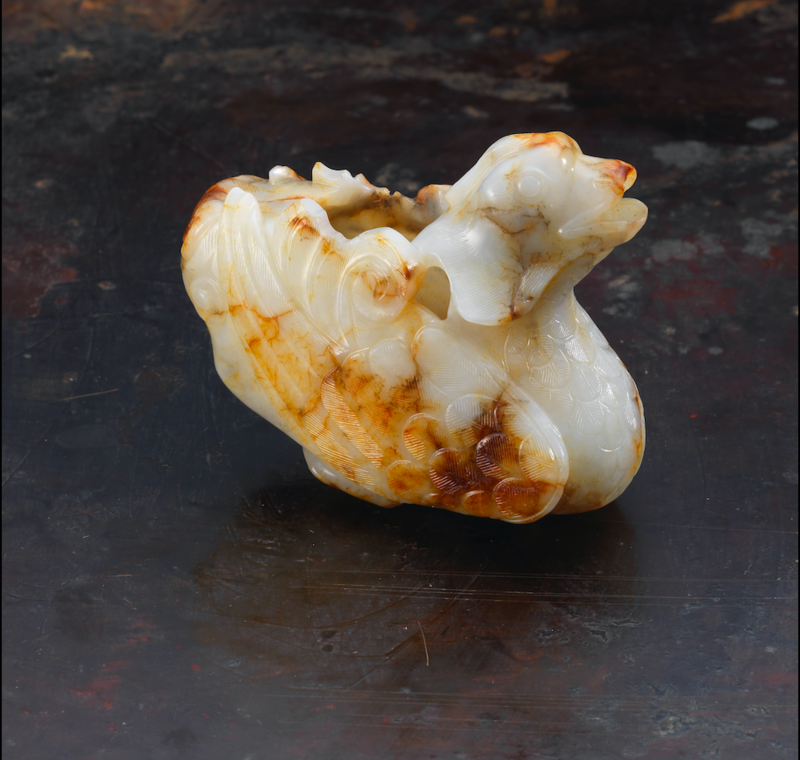 Likewise, although we have endeavoured over the years to promote ‘chicken-bone’ jade and to illustrate that it was very much in vogue during periods such as the Song and Qing dynasties by presenting superb pieces in this material, with many examples carved in the Palace Workshops, it unfortunately remains less popular than jades of other colours. 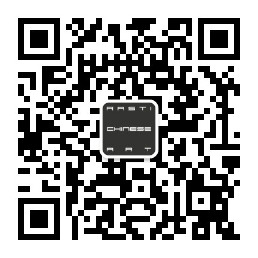 Nevertheless, we call attention to the Qianlong period baluster vase (no. 9), which has European-style details and was perhaps commissioned for the Old Summer Palace, or Yuanming Yuan. Two large white jade vessels in this selection, both from an important Taiwan collection, occupy opposite ends of the spectrum for imperial objects made for the Qianlong court. 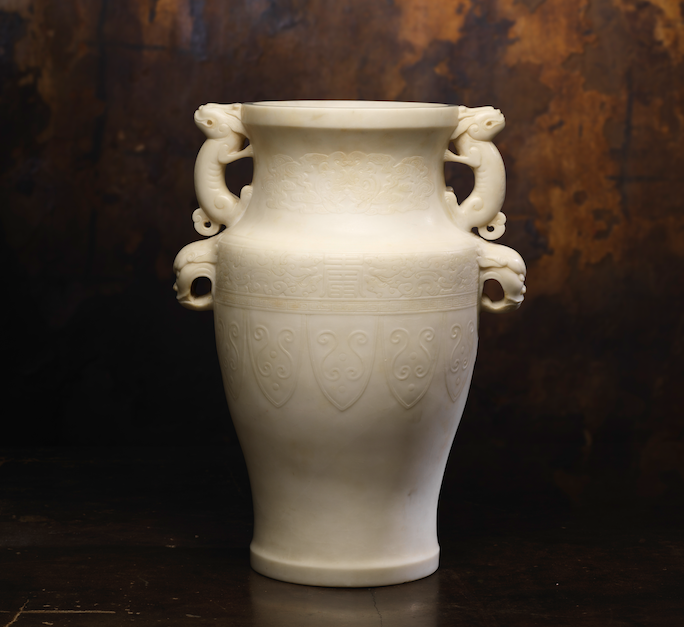 The first, a white jade magnolia vase with russet patches (no. 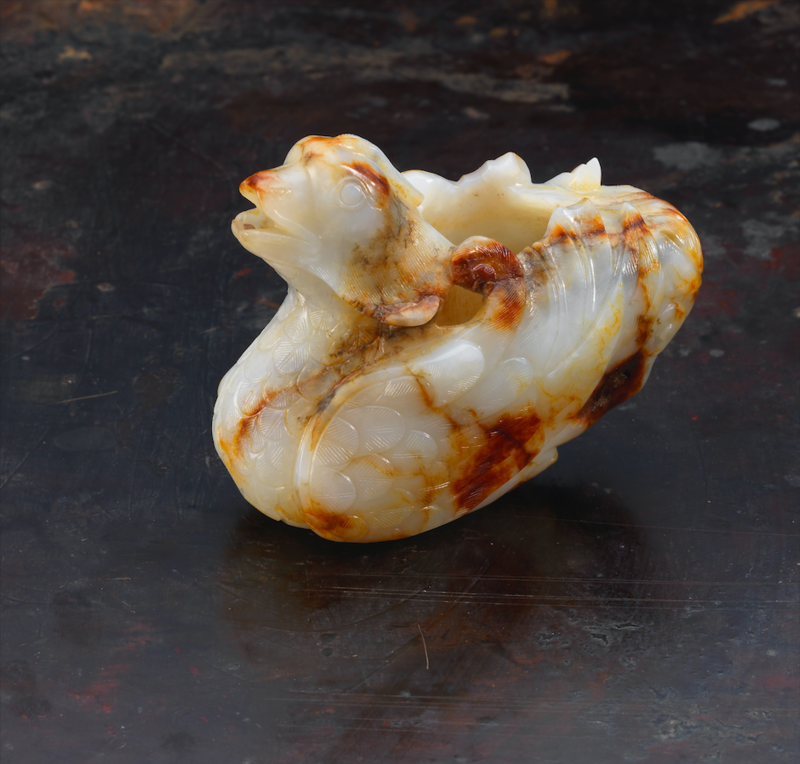 11), is boldly carved in the finest Khotan jade. The second, a plain vase and cover (no. 10), emphasizes the material’s even tone, and is accented only with dragon handles. It is precise in form and does not attempt to disguise any flaws in the material with elaborate carving. 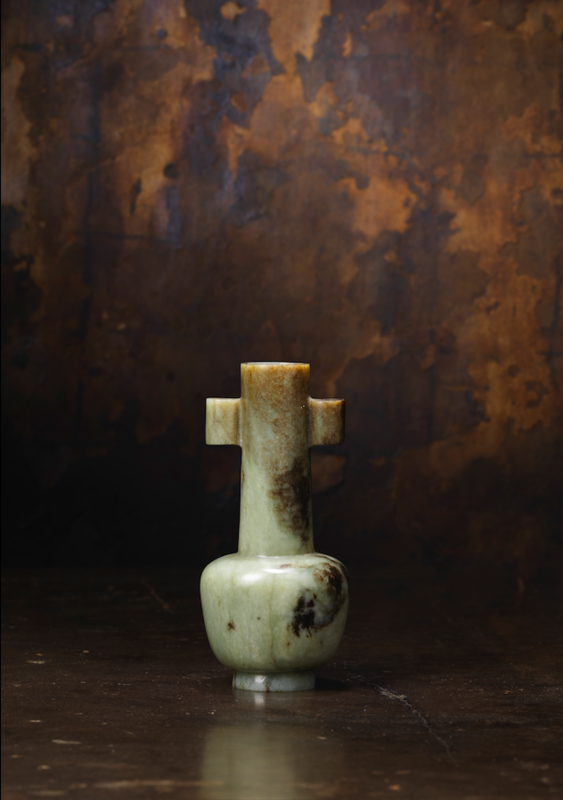 It was referred to by Yang Boda as the pinnacle of Chinese craftsmanship in two publications he authored, Essence of Qing Jades (Chicago, 1995, pp. 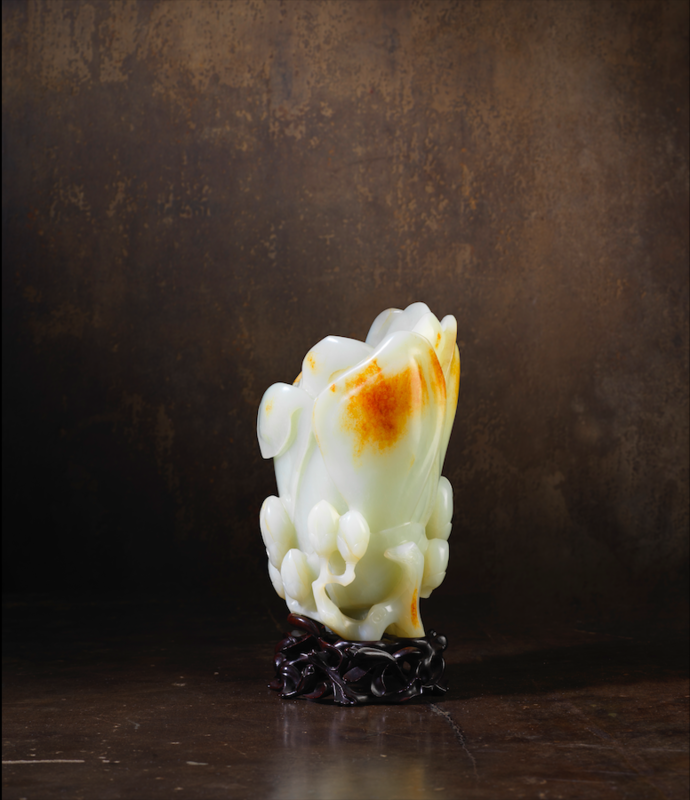 46–47) and ‘The Superb Craftsmanship of Chinese Jades from the Qing Dynasty, Qing Yu Duo Ying’, in The National Palace Museum Monthly of Chinese Art (Taipei, no. 116, November 1992, pp. 49–61). 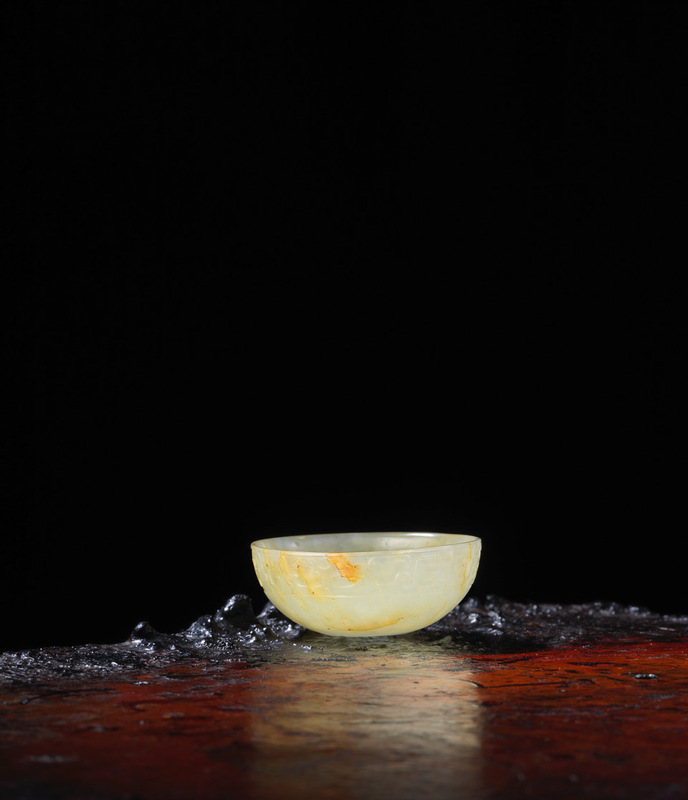 The yellow jade vase and cover (no. 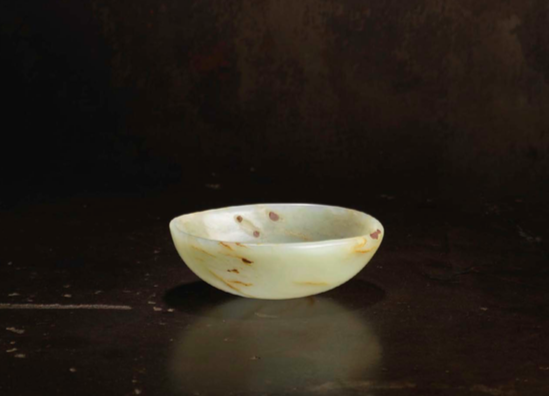 12), sold first at Spink & Son in 1957 and subsequently during Knapton Rasti Asian Art’s inaugural exhibition in 2001, is also a superb example of a vessel highlighting its form, which is devoid of decoration. Of the finest shade of yellow, it is similar to the white vase and cover above in that great restraint was shown by the carvers in both instances. 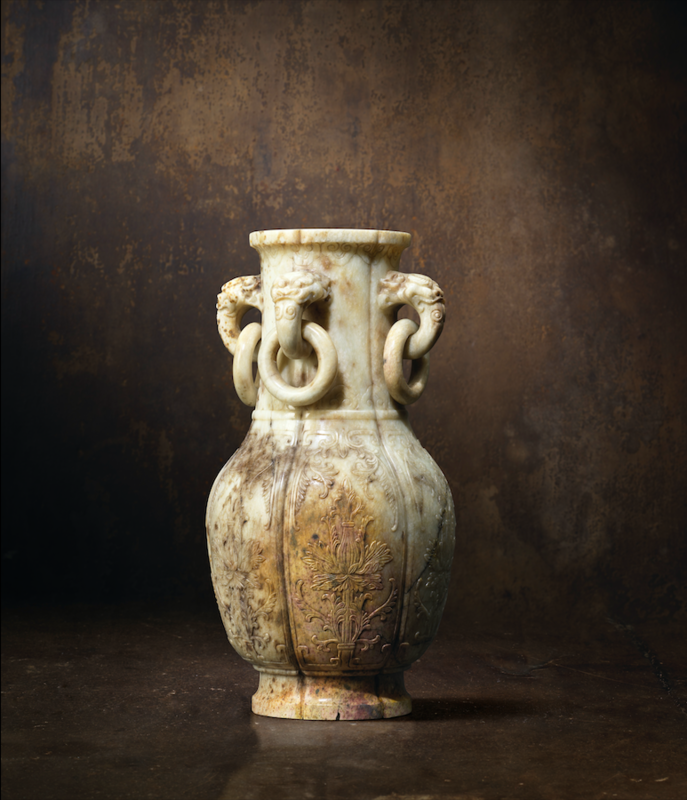 Lastly, a large imperial marble vase (no. 13) from Hebei province, where the finest quality material was mined for works destined for the Forbidden City, is included in the exhibition. 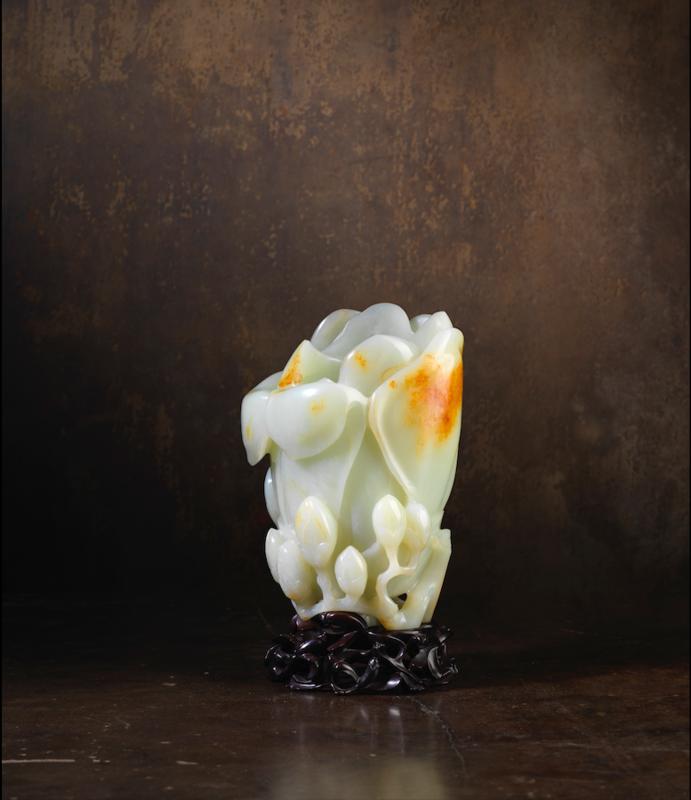 A comparable vase can be found in the treasure cabinets at Shu Fang Zhai (The Studio of Cleansing Fragrance) in the Forbidden City, and three other examples were featured in the gallery’s October 2016 exhibition. 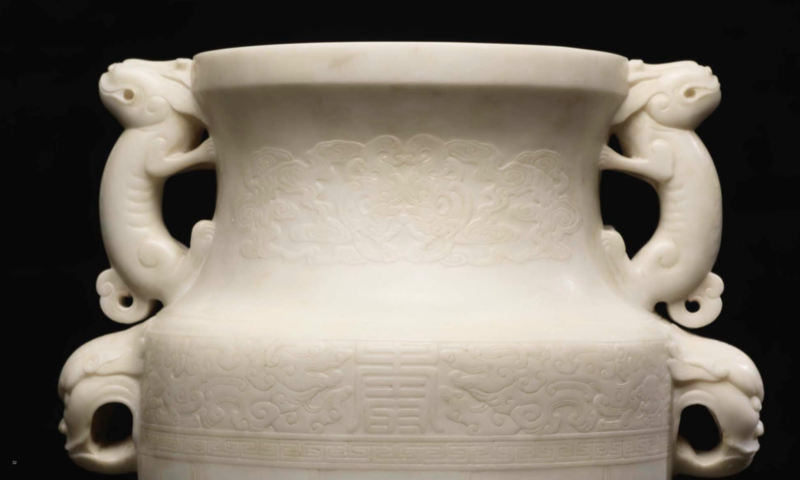 This vase has been included for its similar imperial carving, and was without a doubt made for the Qing court, most likely during the Yongzheng period (1723–35). The fine dragons softly executed on the body and the details on the handles illustrate the best of carving on jade. It is with great pleasure that I present, for the first time, an exhibition with my brother Pedram Rasti. 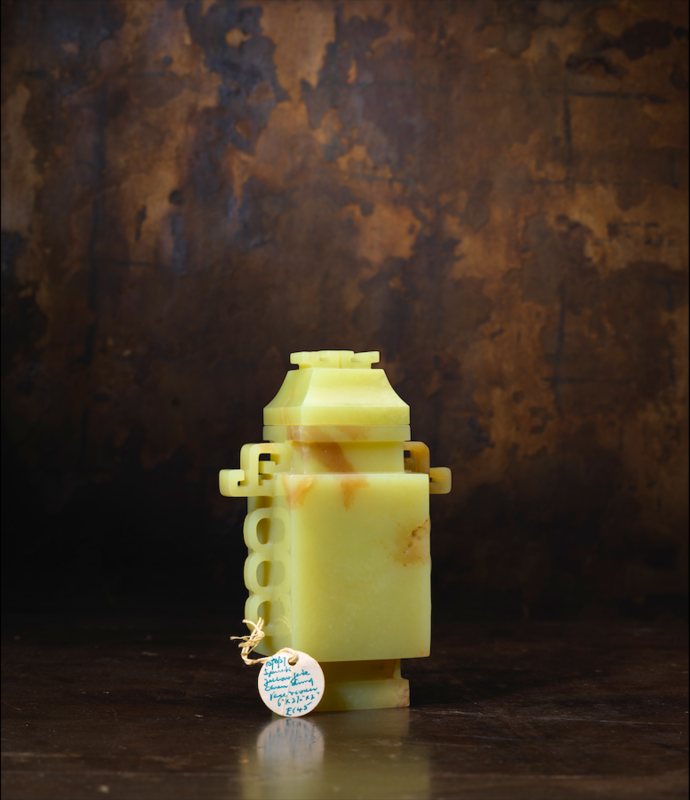 The exhibition will first open in Hong Kong and then travel to London. Once again, Mark French proved invaluable with his imaginative and superb photography and Karis Yam was crucial for her organizational skills, but most of all, I would like to thank my C.F.O. who is also the M.O.U.